Senior Buying Manager Local Food at Asda, Michael McCallion; VP Commercial Execution at Asda, Tracey Ford; Asda Antrim General Store Manager, Robert Ryans; and Senior Director Northern Ireland at Asda, George Rankin. Front Row, L-R: Robert Brown from Tayto; Jamie Thompson from Thompson's Tea; Eileen Hall from Cavanagh Free Range Eggs; and Mervyn Jones from Mash Direct. Following the announcement of the Great Taste 2018 results, Asda is celebrating the success of its suppliers from Northern Ireland. From Thompson’s Punjana Tea to Cavanagh Free Range Eggs, Mash Direct Mashed Potato and Mash Direct Red Cabbage & Beetroot, and Tayto Craft Causeway Sea Salt & Malt Vinegar Flavour Hand Cooked Crisps – Asda suppliers from Northern Ireland secured a total of 15 Great Taste wins. 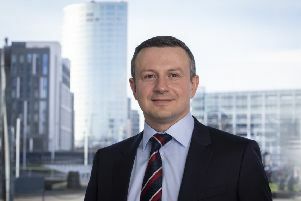 Asda senior director for Northern Ireland, George Rankin, said: “At Asda, we are committed to supplying the highest quality of local produce for shoppers at our 16 supermarkets across Northern Ireland. To ensure award-winning food and drink is on offer, we need to support the local suppliers we work with on a regular and ongoing basis. “With regional and national contracts across our store network open to Northern Ireland producers, we continue to back and invest in suppliers working across the region. “Congratulations to the Asda suppliers from Northern Ireland who were accredited with Great Taste stars this year. “With over 12.6k entries, and only 37% of entries accredited, a win is a great achievement and testament to the hard work invested by both Asda and its suppliers.